Eugenia Falleni, alias Harry Crawford, special photograph number 234, Central Police Station Sydney, 1920. New South Wales. Police Dept. Special Photograph no. 234. When 'Harry Leon Crawford', hotel cleaner of Stanmore was arrested and charged with wife murder he was revealed to be in fact Eugenia Falleni (sometimes spelt as Eugeni), a woman and mother, who had been passing as a man since 1899. In 1913, as 'Harry Crawford', Falleni had married the widow Annie Birkett. Four years later, shortly after she announced to a relative that she had found out 'something amazing about Harry', Birkett disappeared. Crawford told neighbours that she had run off with a plumber. In 1919 Birkett's young son, who had remained in Crawford's custody, told an aunt of attempts made on his life by his drunken stepfather. The aunt contacted police. A charred body which had been found in Lane Cove in 1917 was belatedly identified as Birkett's. 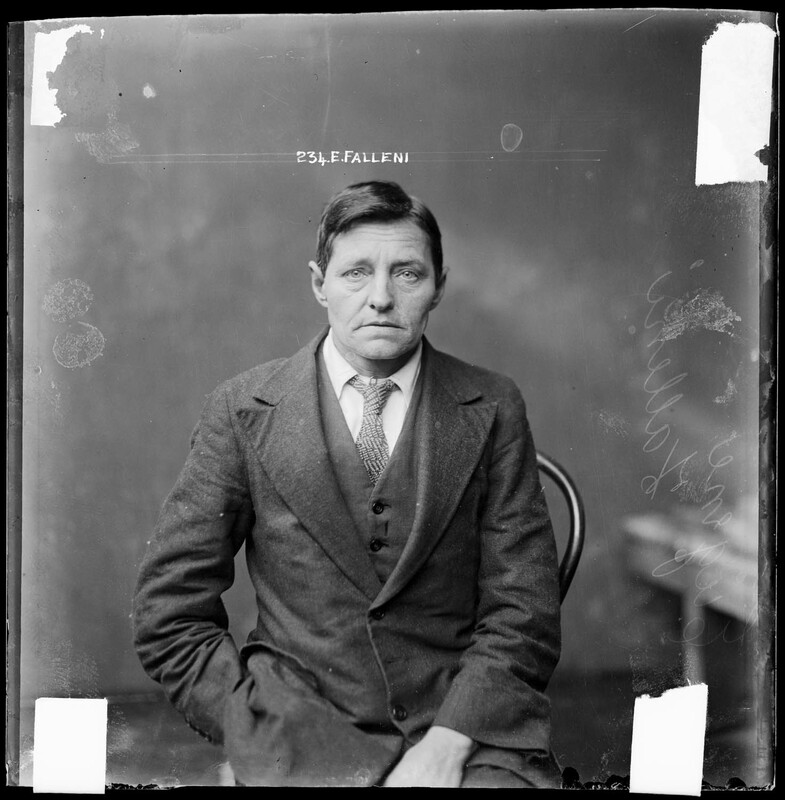 'Crawford's' astonished second wife, when finally convinced of Falleni's true gender remarked, "I always wondered why he was so painfully shy ..." The photograph shown here shows Falleni in male clothing, probably on the day of her arrest. The negative was found in a paper sleeve inscribed 'Falleni Man/Woman'. It is also possible that Falleni was made to dress in a man's suit for the photograph. Peter Doyle with Caleb Williams City of shadows: Sydney police photographs 1912-1948 Historic Houses Trust, 2005, pp.199, 236. Mark Tedeschi Eugenia: a true story of adversity, tragedy, crime and courage Simon & Schuster Australia, 2012. City of Shadows at the Justice & Police Museum, Sydney, November 2005-January 2007. Mug shot of Fay Watson, 24 March 1928, Central Police Station, Sydney. Mug shot of Ah Chong, 11 July 1928, Central Police Station, Sydney. Mug shot of 'Ah Num' and 'Ah Tom', ca 1930, Central Police Station, Sydney. Mug shot of Eileen May Burt, 3 January 1924, Central Police Station, Sydney. Mug shot of Nancy Cowman, 21 February 1924, probably Central Police Station, Sydney. Mug shot of Henry Reid, 7 January 1930, Central Police Station, Sydney. Mug shot of De Gracy (sic) and Edward Dalton. Details unknown. Central Police Station, Sydney, around 1920. Mug shot of Sidney Kelly, 25 June 1924, Central Police Station, Sydney. Mug shot of Harris Hunter, 17 September 1924, Central Police Station, Sydney.